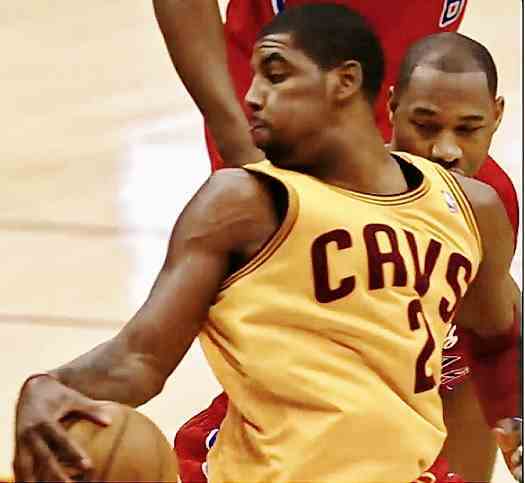 Kyrie Irving drives along the baseline and scores against the Chicago Bulls. NBA All-Star Kyrie Irving of the Cleveland Cavaliers has purchased the Westlake, Ohio home of recently split Keyshia Cole and former Cav teammate Daniel "Boobie" Gibson. Irving paid $800,000 for the 5,508 square-foot home that was built in 2007 and has five bedrooms, four full bathrooms and one half, and a three-car garage. Listing information for the home boasts of Brazilian cherry floors in the dining room and kitchen, a circular staircase that leads to the upstairs bedrooms, home theatre, game room, and a trophy room. Kyrie Irving's house in Westlake, Ohio. Listing photos can be seen here. Property records show that Daniel Gibson purchased the home for $1,050,000 in late July 2009 from Kellen Winslow II and his wife Janelle Winslow although Janelle Winslow's name is the only owner who appears on the property records. Kellen Winslow II is the son of NFL legend Kellen Winslow and played for the Cleveland Browns from 2004 to 2008. Keyshia Cole and Daniel Gibson wed in May of 2011 and are currently undergoing a divorce. As for Irving, this appears to be the first home purchase for the point guard phenom who is just twenty-two years old.